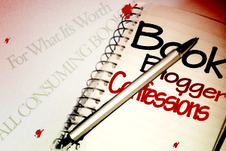 Book Blogger Confessions is a new bi-weekly meme hosted by Tiger @ All Consuming Books and Karen @ For What it's Worth Reviews. Choosing your next book. How do you decide which book to read next? How do you balance “review” reading with “fun” reading? This is an easy one I choose whatever I am in the mood for, if what I do pick up isn't holding my interest I put it down and pick up something else :). Currently and for a while I haven't been reading much review books so it's mostly been just books read for my own pleasure, which is the way I prefer it and I don't plan on accepting any more then one book at a time to officially review through requests. I can't wait to have a break from review books to put in something fun!